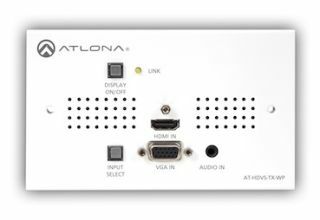 The What: Atlona, a leading digital connectivity solutions provider, has released its new HDVS family of HDMI and VGA/Audio products — the AT-HDVS-TX box, AT-HDVS-TX-WP wall plate switcher/transmitters, and AT-HDVS-RX scaler/receiver with signal transport via HDBaseT. When combined, these products provide connectivity and control for installed AV systems by enabling the use of both VGA and HDMI sources in addition to control of connected displays. For VGA sources, analog audio is embedded within digital video signals. The What Else: In smaller rooms with digital displays such as flat panels and projectors with DVI or HDMI inputs, the new units provide the most effective solution to transition from analog to digital sources. With balanced analog audio de-embedding, the units provide a simple interface to external audio systems, while the integrated scaler ensures compatibility of VGA sources with any display. The AT-HDVS-TX-WP fits both U.S. and U.K. 2 gang wall-boxes and features a rugged steel construction, making it ideal for classroom settings. With HDBaseT, users obtain reliable connection distances up to 230 feet (70 meters) from the wall plate using a single category cable. Because they use Power over Category cable (PoCc), there is no need for a power source at the wall plate, leading to a simple installation and setup process. Both the AT-HDVS-TX and the AT-HDVS-TX-WP are controllable by illuminated buttons, RS-232, or using auto-switch to select the last connected source. Flexibility is furthered with the AT-HDVS-RX — a fully functional scaler — now equipped with HDBaseT input and HDMI output with balanced, de-embedded analog audio. Additionally, the unit can control displays based on signals received from the AT-HDVS-TX or AT-HDVS-TX-WP or can be controlled by RS-232. The Bottom Line: Both the AT-HDVS-TX or AT-HDVS-TX-WP can be used for switching/control in a simple system or as input and output devices in larger systems. The AT-HDVS-TX is ideal for use with displays with HDBaseT inputs, since it can be powered both directly as well as by PoCc from the receiver. For systems with multiple displays, the AT-HDVS-RX scaler/receiver provides simple resolution management and signal distribution via HDBaseT.